I see colour in everything - objects, shadows, darks and lights - on a bright day or a dull day (a bright day is so much better don't you think?) My Dad taught me there is every colour in everything, I understood him a little literally but - hey - it works for me!! I like to see the colour of everything reflected into everything - it's fun to try and make it happen. Painting a watercolour is making the best of an emergency. I really love painting still-life but not just ordinary still-life, and certainly not traditional still-life - i love abstracty still-life. I love letting the colours run together or just letting them bleed "outside the lines". One of my main pleasures is painting a few brush strokes and watching the paint pigments mingle and blend by themselves. I was worried because I painted the main black bottle, which has become the focal point, in the centre of the painting. 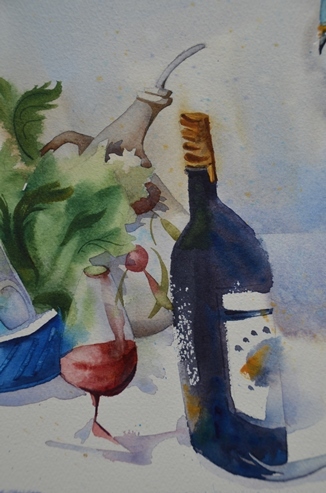 In actual fact, this is my favourite element in this painting - I'm super pleased with the dry brush 'highlights' where my brush has just skipped over the rough surface of the paper; the lost and found label edges and some re-found sharper edges and the shape of the bottle - i love wonky bottles!! I accidentally created a bloom on the top left of the table top but I decided to leave it. Just to draw your eye further around the painting, I added some "impasto" shots of contrasting colour: straight from the tube, in this case raw sienna placed on top of it's complementary violet and manganese blue. I used a similar technique on the rug but less in your face! The salad leaves are all a bit higgledy-piggledy as they always are, I painted some shadow shapes on the oil jug and also painted negatively around some leaves just to add variety. I deliberately let the red of the onion bleed into the grater, it becomes a reflection on the shiny steel and also a little bleeding on to the top of the lemon - no explanation for this, some of these marks I let happen simply because they please me. :) I really love painting the long greenery coming out of the onions, twisting and turning with lots of texture. What do you think of my busted up fork? We've all got one of those in our kitchens!! They often seem like the perfect tool to do something stupid, and then they bend!! I don't know about you but I'm always shocked at how weak they are for the task at hand - lol!! I put the fork there because I realised I had 2 sides of a painting and nothing to bridge the gap!! Although I always sketch out a thumbnail plan, the painting doesn't always end up the same, so the fork seemed to be the ideal solution. 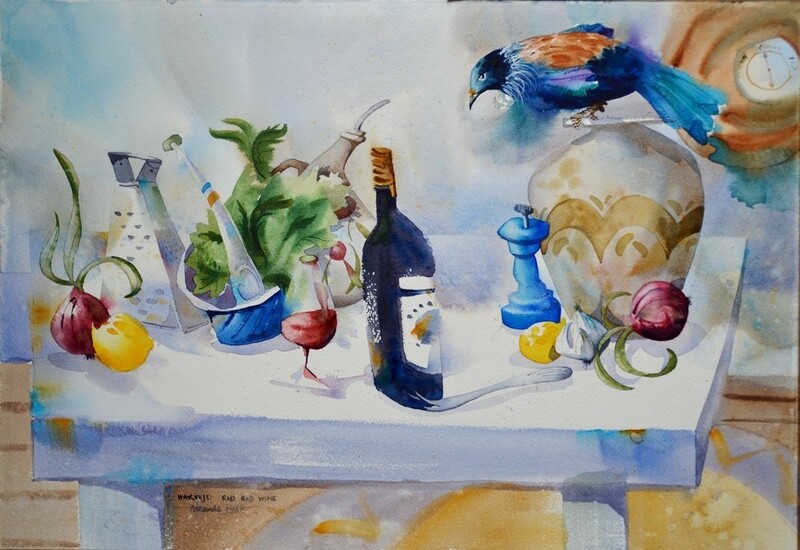 It was a big risk putting Edward's Barometer in the corner but the complementary, darker, stronger tones of the tui sitting on the vase help to bring your eyes back to the focal area of the setting. Another risk (I must be a bit of a gambler!) was the bleeding from the tui, under his breast and the purple at the top of his tail, once they bleed out I just left them - no tidying up - did he just land or is he about to take off? has he spied any treats to steal? The bleeding of colour creates a sense of movement and volume. If you would like to comment, feel free to flick me an email.